Following criticism from Catholic leaders, Rep. Paul Ryan's support of Ayn Rand's ideas is again under media scrutiny. Some reporters have referenced a Paul Ryan speech given in 2005 at an Atlas Society event, but the full audio of that speech has not been publicly available until now. The Society is now releasing the audio in order to encourage accuracy in reporting. 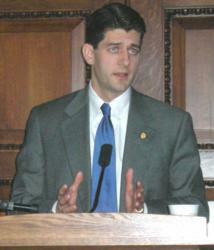 Rep. Paul Ryan, speaking at a 2005 celebration of Ayn Rand's life, sponsored by The Atlas Society. I always go back to... Francisco d’Anconia’s speech [in Atlas Shrugged] on money when I think about monetary policy. Last Thursday and Friday a flurry of news stories appeared addressing—again—the link between Rep. Paul Ryan and Ayn Rand’s ideas. The new stories and blog posts were in response to a National Review article (“Ryan Shrugged”) which seemed to characterize as “urban legend” not only the idea that Paul Ryan is an Objectivist (he’s never indicated he is), that he embraces an Objectivist epistemology (he’s never said that he does), but also that he is a devotee of Ayn Rand, and that he requires that his staff read Atlas Shrugged. Some reporters quoted a sentence or two (circulating for some time on the Internet) made by Ryan at a 2005 Atlas Society event celebrating Ayn Rand. This morning The Atlas Society released, on their website, the full audio of Ryan’s speech. -- "I grew up reading Ayn Rand and it taught me quite a bit about who I am and what my value systems are, and what my beliefs are. It’s inspired me so much that it’s required reading in my office for all my interns and my staff." --"I always go back to... Francisco d’Anconia’s speech [in Atlas Shrugged] on money when I think about monetary policy." --"We have to go back to Ayn Rand. Because there is no better place to find the moral case for capitalism and individualism than through Ayn Rand’s writings and works." To hear the full audio of Ryan's speech, and to read excerpts from it, click here.